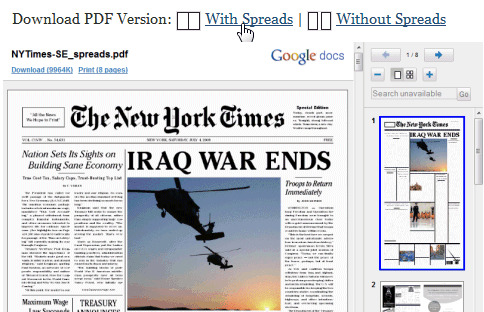 Google Docs Viewer is a handy way to view PDF, PPT and TIFF files online, without having to install plug-ins or additional applications. Unfortunately, Google didn’t make it easy to use the viewer without having to manually generate URLs. A Greasemonkey script automates the process by replacing all the links to PDF, PPT and TIFF files from a page with links to Google’s document viewer. To use the script, you need to install Greasemonkey in Firefox or use a dev build of Google Chrome. It should also work in Opera, Safari + GreaseKit and Internet Explorer + IE7Pro. Hopefully, the future versions of Firefox, Chrome and other browsers will allow users to associate content types with web services, so that you can open KML files in Google Maps, iCal files in Google Calendar or Microsoft Office files in Google Docs. “When you share a folder, the new permissions are pushed to all sub-folders and docs within the folder. Normally this happens quickly, but occasionally, it could take a couple of minutes,” explains Google. 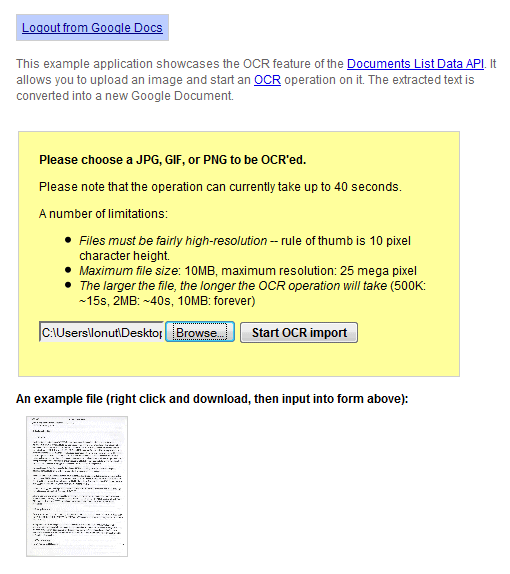 Google Docs API tests a new feature that lets you perform OCR (optical character recognition) on an image. There’s a live demo that illustrates this feature: you can upload a high-resolution JPG, GIF, or PNG image that has less than 10 MB and Google Docs extracts the text and converts it into a new document. Google mentions that “the operation can currently take up to 40 seconds” and a small test showed that the service is not yet reliable: it’s slow and it frequently returns errors. There aren’t many free OCR services available, so an OCR service provided by Google would be very popular. 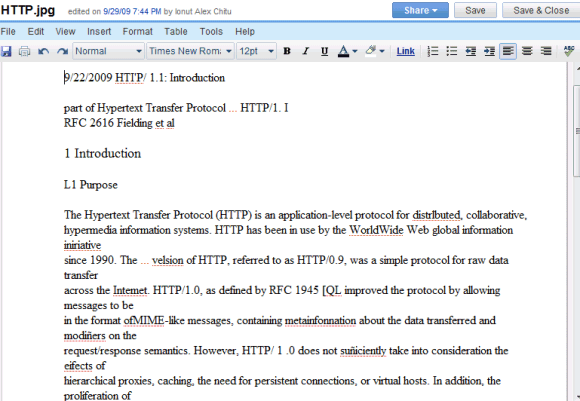 ABBYY FineReader Online is one of the best online OCR services, but the free version is limited to 10 pages a day. Google sponsors the development of an open-source OCR software called OCRopus, but it’s not clear if the online service provided by Google Docs uses OCRopus. If you have a lot of labels in Gmail, it’s difficult to see all of them without scrolling down. In July, Gmail added an option to hide some of your labels, so that the most important labels are always visible. Unfortunately, if you receive a message that’s automatically labeled using a filter and the label is hidden, you’ll miss the message. A new feature from Gmail Labs solves this problem: enable Hide read labels and “the visible labels in the navigation bar will be hidden under the ‘more’ menu when they don’t contain any unread conversations”. Since the feature only hides visible labels, you can go to the label management page and click on “show all” next to your labels. If all your labels are visible and Hide read labels is enabled, Gmail will only show the labels that include unread messages. Google Reader has a similar feature: if you click on the arrow next to your subscriptions and select “show updated”, you’ll only see the folders and the feeds with unread items. 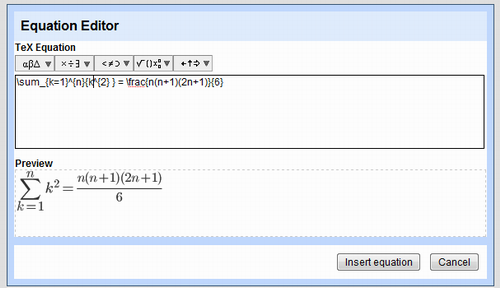 Google Docs added the equation editor previously available in Knol. It’s a basic LaTeX editor that’s not very easy to use if you aren’t familiar with LaTeX or programming. Open a Google Docs document, click on “Insert” and select “Equation” from the menu. You can type LaTeX code or use the drop-downs to select Greek letters, fractions, integrals, functions, summations and other operators. Google converts the code to an image using an undocumented feature of the Google Chart API. If you export the document as a Microsoft Word file or in a different format, Google Docs will only include the corresponding images. If you know a better online LaTeX editor, tell us about it in a comment. For some reason, Google decided to release a new version of the Google Docs List API before adding the features to the interface. One of the most important new features is folder sharing. I’ve used a Python library to test the new version of the Google Docs API and I’ve managed to share a folder. 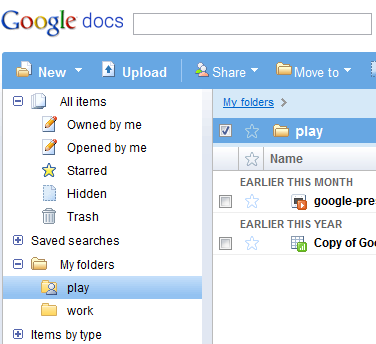 As you can see, the “play” folder from the screenshot displayed below has a new icon. Unfortunately, the shared folder didn’t show up in the collaborator’s Google Docs interface, but he was able to find it by visiting this hidden section. Sharing folders is more efficient than sharing a large number of files one by one and the best thing is that folders are treated just like documents. 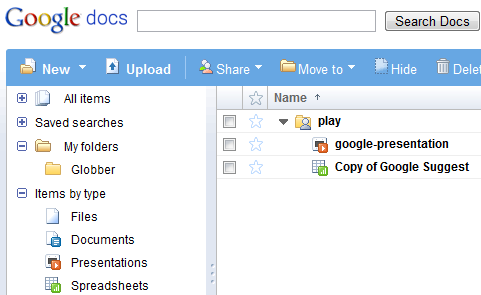 You can share folders as “read-only”, but you can also allow collaborators to add new files and to edit documents. 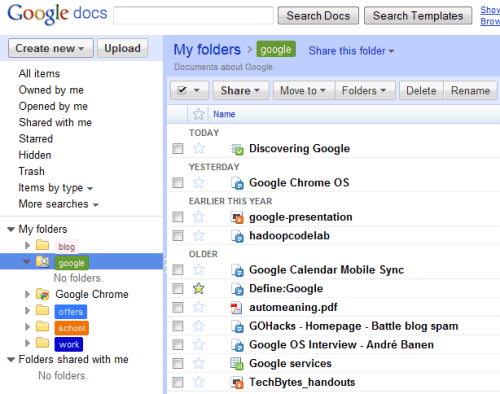 For now, folder sharing is only available using the Google Docs API, but it will be added to the interface very soon. Google Docs is now integrated with Google Translate so you can translate documents directly from the word processor’s interface. Click on the “Tools” menu, select “Translate document” and choose the destination language. Google will translate your document and offer two options: “Replace original document with this translation” and “Copy to new document”. The problem is that in both cases there’s no link between the original document and the translation. 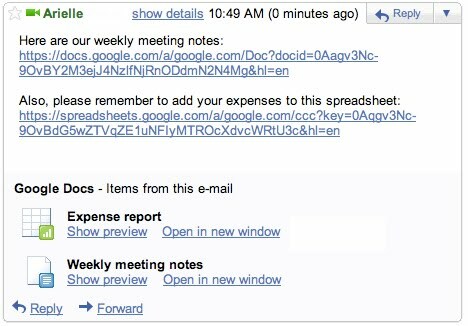 To better translate documents collaboratively, Google should integrate Google Translator Toolkit into Google Docs. If you want to translate documents, but they’re not stored in Google Docs, you can upload them to Google Translate. Tip: Probably the best way to translate a web page, including a Google Docs document or presentation, is using the new Google Toolbar for Internet Explorer. 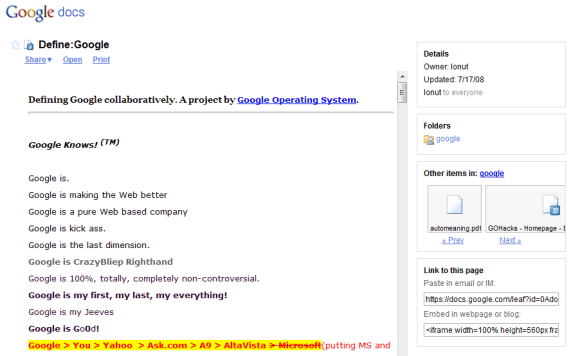 Even if IE is not your favorite browser, you should try it because the Google Translate integration is brilliant. Unfortunately, you can’t export the translation. In May, Gmail launched a feature that lets you import messages and contacts from other mail services like Hotmail, Yahoo, AOL. Google promised that the feature will be rolled out to all accounts, but it was only enabled in new accounts. The good news is that the feature is now available in all accounts and you can find it if you go to the “Accounts and import” tab from the settings page. * Mail importing saves to your Gmail account the existing messages from other accounts and continues to check for new messages only for 30 days. Gmail’s mail fetcher downloads the existing messages and checks for new messages indefinitely. * Mail importing saves to your account messages and contacts, while Gmail’s mail fetcher doesn’t import contacts (you can manually import contacts). * Mail importing works for mail services that don’t support POP3 (for example: the US version of Yahoo Mail), but the mail fetcher requires POP3. Mail importing supports a small number of popular mail services. “Copying mail over usually takes a couple days, occasionally up to a week — but eventually it all arrives. And once it’s done, you can forget your old account and enjoy having everything in one place,” says Google, but I disagree. You’ll import the old messages to your account, but after 30 days the service will no longer fetch new messages.